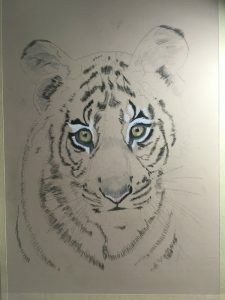 Work in progress on a gorgeous Bengal Tiger Cub. Apologies that one side is a bit dark. Its pastel pencil on sand Pastelmat and approximately A4 in size. Photo reference Dr Chet Trivedy when he recently visited India.